The twenty-six pieces in this book are etudes that develop sensitivity to the different intervals and the ability to sing and hear them accurately. 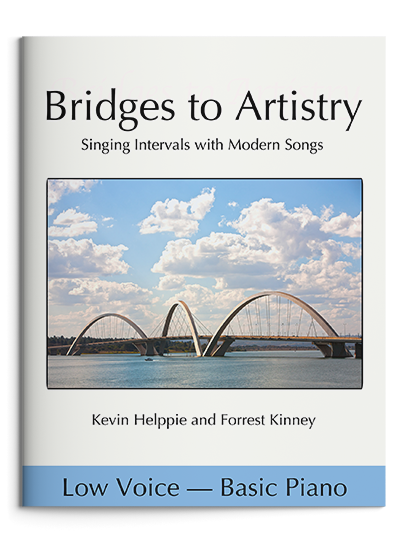 We envision this book being used and enjoyed by voice teachers and students, music theory students, and any instrumental musician. In this piece, every interval but one is a whole step (a major second). This means that this piece uses what is called a “whole tone scale.” The composer most closely identified with his scale is Claude Debussy, the first major composer to use it extensively. We felt that this scale, with its complete lack of half-step “pull,” conveyed the floating quality of falling snow. We later reharmonized the tones in a minor key and finally a spring-like Lydian mode. This piece is in a jazz style often called “up tempo swing”—a very broad musical category. We encourage singers to come up with different words (perhaps drawn from personal experience!) for the final verse. The melody in this song moves mostly by half steps (minor seconds) so the next note (much like the person referred to in the song) is usually just a half step away. This composition is to be played and sung quite freely, almost without a beat. The piano chords are like stabs of painful memories while the melody seems to grow out of them. This piece features the contrasting sounds and emotional effects of major seconds (whole steps) and minor seconds (half steps). In this song, the half steps (minor seconds) play the role of “blue notes”—lower neighbors below the third of each chord. The blue notes in this piece “slide” out of and then back into the third. The harmonic structure of the piece aligns with the classic 12-bar blues form which consists of three four-bar phrases. If the performer likes, he or she could add additional verses by repeating the 12-bar form with additional “hair woes” lyrics. The piano part is playable by beginning pianists, perhaps including the singer. This piece can be performed slowly and wistfully or performed quickly and rhythmically—we suggest trying both ways and then choosing. This song is set in the 19th century when waltzes were the rage. We imagine a large candle-lit dance floor occupied only by two “friends” (in private, they are much more) who have stayed on after others have left. They desperately want to stay together, but one must leave at dawn—perhaps to go off to war. The piano part is “bare bones” to allow more people to play it, so experienced pianists should feel free to vary and embellish it. The melody of this waltz features both major and minor thirds. This song is in a classic rock style so both performers should place an emphasis or an accent on the weaker beats in the measure. This would be beats 2 and 4 in 4/4 time. In 2/2 time (the meter of this piece) , that would be the beat that initiates the second half the measure. These are called “backbeats.” In much rock music, you usually hear the drummer hitting the snare drum on the backbeats. The calypso rhythm—like all Afro-Cuban rhythms—is complex, usually being created by a number of percussionists playing different rhythmic patterns simultaneously. The simple piano part of this piece evokes and reinforces the syncopated rhythms that characterize this lively musical style. Page 25 shows the singer two approaches to learning the syncopated rhythm pattern. The accompaniment of this piece and the melody are both filled with the evocative sounds of the interval called a “perfect fourth.” With the except of one note (the F in measure 20), the melody is made entirely of the tones in a C penatonic (five-tone) scale. These tones are C, D, E, G, and A. This scale is used widely throughout Asia and the world. The fourths and the pentatonic scale combine with the lyrics to transport a listener to another time and place. This piece features “quartal harmonies” (chords built with fourths rather than the usual thirds) in the piano accompaniment. It was inspired by the jazz pieces of Miles Davis, in particular, “So What.” So, the style of this piece would be called “modal jazz” because it evokes various Dorian modes, though all the notes in the Dorian mode are not there. This is another piece in rock style, so emphasize the “backbeats” discussed at the top of this page. It is important that both performers maintain an even tempo and not rush the syncopations, which often happens when playing or singing “off the beat.” Singers are advised to drop the letter T from “don’t” and “want to” (wanna) so the pronunciation sounds more vernacular and not too proper. Let the rebel revel! This song is in the bossa nova style, particularly that of its leading exponent, Antonio Carlos Jobim. Mr. Jobim, or Tom (as many friends nicknamed him), lived from 1927 to 1994, most of the time in his native Brazil. He wrote the famous song Girl From Ipanema, among many others. The reference to Ipanema in the lyrics is a nod to Jobim, a brilliant composer of songs. In the 19th century, composers were especially fond of following one dominant seventh chord with another, delaying the resolution of the harmony for many measures. So, the progression is of that nature and is reminiscent of that time. It is worth noting that the lyrics are not completely fanciful. The typical music student in the 19th century was a merchant’s daughter who did not attend school (public schools didn’t yet exist) and had much time on her hands—hands that would gladly find amusement at a keyboard instrument. This song is a shuffling blues piece, so swing those eighth notes. It features the enigmatic —and tough to perform—interval of a tritone (three wholes apart) that rightfully earned the moniker diabolus in musica (devil in music) in medieval times. Depending on how it is written, this interval is now usually called either a diminished fifth or an augmented fourth. Modes (Dorian, Lydian, and so on) have made a strong comeback among composers in the last century. This piece is in a Dorian mode to evoke the medieval era when this mode was the most popular of melodic materials. Also, the pervasive fifths in both the piano part and the vocal part evoke monks singing Gregorian chants. We imagine an old wayfarer returning to the cathedral he left as a young man, a place where we was studying to become a monk many years before. This jazz ballad, an exploration of descending fifths, was inspired by the collaborations of pianist Bill Evans and vocalist Tony Bennett. Evans was a jazz innovator, bringing his classical training and love of Ravel and Debussy into the jazz piano world. Evans and Bennett collaborated on a number of recording projects before Evan’s untimely death in 1980. This song is a modern version of a Neopolitan song, similar to those by Donaudy or Tosti. It’s a waltz in the romantic era style, therefore the occasional and purposeful delay of the third beat will add an appropriate rubato feel to the performance. Imagine yourself in an Italian Bistro with twinkling white lights hanging from trellises, checkered table cloths, and a nearby accordion player playing a serenade. It’s a “slow night” in the bistro, so you and a companion might be the only customers. But that won’t stop the accordionist (and in this case, the singer and pianist) from singing and playing with ardor. The minor sixth has always been an interval that composers have used to pull at the “heart-strings” of the listener. We hope this song will have the same effect on modern audiences. This song has two main phrase ideas, each of which require the singer to nuance different notes to let the melody have a sense of release and to not over emphasize phrase endings. In measures 1-8, place more emphasis on the quarter notes and let the longer tones be sung more softly. Do just the opposite in measures 9-16. Sing the quarters more softly and the longer notes with more emphasis. This approach will let the tenderness of the song come through. When it comes to meter and 4/4 time, one of the first lessons we musicians learn is the traditional emphasis on beats one and three. That idea works beautifully in classical pieces. Then when we explore the worlds of jazz and rock, we come to learn that two and four are often very effective beats to emphasize, the “backbeats” referred to earlier. We suggest that beat four of the measure, especially in the vocal line, be a point of emphasis. This will propel one measure forward to the next and impart to the music that sense of moving toward a better future spoken of in the lyrics. This song has a lot of underlying rhythmic drive and energy already “built in.” The key to interpreting this song for both pianist and singer is to let the energy remain understated, so as to suggest emotions lying just underneath the surface. In order to do that, let the syncopations be evident but not over accented. Then the listener will be drawn into the open-ended theme of this particular lyric. This lament is filled with large leaps downward. The tendency is to land too heavily on the second note of each leap. So let the first note of these leaps be strong and the second note be much lighter in weight. In this way, the natural syllabic stress of many of the words will be maintained. The pianist can underscore this idea by playing the eighth notes in the second half of each measure more lightly. Shakespeare wrote, “The play’s the thing...” For musicians in many musical situations, a parallel quote might be, “The phrase is the thing.” That would certainly be true in this ballad. Performers are encouraged to think in terms of phrases at least four-measures long. Can you think of the opening phrase from measures 3-10 as a phrase of eight measures? Give it a try, and you might just become an interpretive “super hero” if you can pull it off! There’s always a bit of nostalgia when one realizes that the long, warm days of summer are coming to an end. However, this jazz song with its walking bass and “comping” (short for “accompanying”) chords suggest there’s still time for a little whimsy and fun. The pianist ought to let the quarter notes in the walking bass feel long and unhurried. In contrast, the singer should make a crescendo on the whole notes, and then taper the half notes that immediately follow. This dynamic effect will be akin to what the “horns” do in a big band, creating excitement without being overpowering. Octaves are often used in melodies to add drama and excitement. However, in this song, the mood is a longing for somewhere light and ethereal. So, in order for the octaves to “serve” their creative purpose in this song, it is suggested that the singer very lightly sing the lower note of the octave (such as in measure 8) on the words, “far, far away.” In bars 26 and 27, the singer is encouraged to sing the words “air” and “care” with an almost British approach in which the ending “r” consonant very discreetly disappears. Lastly, the vocalist sings a series of “ah’s” at the end of the composition similar to the Rachmaninoff Vocalise. The singer of this piece can experiment with other closely related sounds such as “oh” or “ooh.” This may help the singer to feel more technically secure in that section of the piece, especially in the high voice version of this song. This piece has the “flavor” of a 70’s folk-rock number. The energy and optimism of this song perhaps hints at a song by James Taylor or Carole King. Descending octaves are featured throughout. The singer should not land too heavily on the first note after the octave. That could cause the song to become ponderous. The note in each phrase that follows the octave leap is “where the action is.” The dotted-quarter note tied to an 8th should have a quick and intentional crescendo. That will serve to energize the phrase. At the bridge of the song in measures 15-22, both the singer and pianist should employ a light staccato throughout that section to maintain the buoyant mood the song establishes in the opening section.